This issue of the Marist Messenger marks the beginning of the magazine’s 90th birthday year and presents us with an opportunity to thank God for all the good that the magazine has done through the years. As most ninety-year-olds might tell you, lasting 90 years is cause for celebration and thanksgiving. The 90th birthday is in November of this year, and starting this month there will be a series of articles telling something of the MM’s life thus far. The Marist who started the magazine, Fr Kevin McGrath SM, edited it for 35 years! No editor since has come near to equalling this record, and it is less than likely that any of his successors will do so. The current editor regrets to admit that should he break Fr McGrath’s mark, he would be at least 103 when he did so! It can fairly be said that the Messenger’s editors down the years have tried to be true to the original vision: to ‘strengthen the homes of the parish with a mother’s blessing’. 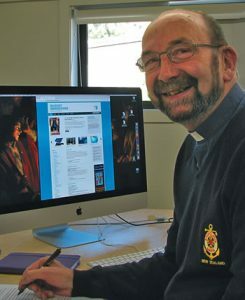 The second editor, Fr Maurice Mulcahy SM, expressed the vision: ‘we hope that these pages will continue to be instruments of peace as they take persons to Jesus through Mary’, in short, to provide spiritual and Catholic nourishment for the magazine’s readers. Some readers are kind enough to write and comment on articles or features that they like in a particular issue, and some are moved to write when they object to something that they have read. All such letters are taken seriously and a response is sent. The time has come, though, to get a clearer picture of readers’ likes and dislikes, so this issue carries in it a survey in its middle pages. The last time that there was a Marist Messenger survey was in 2005. 683 people sent replies, and the November issue contained a summary of the results. It was recorded that 495 respondents thought the Daily Reflections were ‘excellent’, 148 found them ‘useful’ and 10 considered them ‘only fair’. For the ‘Can You Bear It’ page, the figures were 198, 213 and 211. 679 respondents lived in New Zealand, and 523 were women. The most memorable comment was, ‘Dear Editor, with the exception of the Friday Flash, this is the only magazine I read from cover to cover’. The MM’s management group would like to hear from you, so please fill in the survey and send it in. We really want to know what you think, what you would like more of, and what you would like less of, or not at all. The magazine is for you, the readers, not for us who put it together each month. A time of anniversary such as this is a time for thanking God about what has happened so far, for reviewing it, and for planning for the future. No one knows whether or not the MM will have a centenary, so it seems important to make a fuss about its 90th birthday! It is certainly important to express gratitude, first of all to God and to Mary; to Society of Mary Provincials who have enabled the magazine to continue; to the editors and to Joanne Oliver, who has been the magazine’s secretary since 1997; and to loyal subscribers, some of whom have been receiving the MM for seventy years or more. It is the generosity of readers who not only pay their subscriptions on time but also make a donation, that keeps the operation going. May God bless each and every one of you, and Mary protect and guide you always.